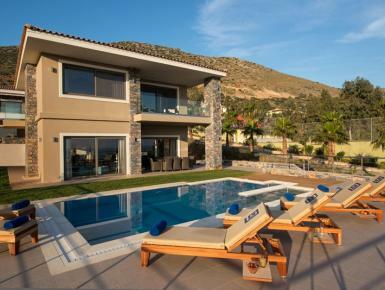 VILLA CRETE has been built to the highest standards and there is nothing that you will miss from home. Located on a hill, just 650 meters from the sandy beaches, it offers quietness, total privacy and a gorgeous sea view. The accommodation consists of 2 floors. The ground floor contains an open plan well-equipped kitchen, living and dining area leading to a very comfortable shaded terrace, overlooking the beautiful pool and the garden with its many different flowers . Entering the Villa you will find on your left hand side the lounging area and on your right hand side wooden steps leading you to the first floor.